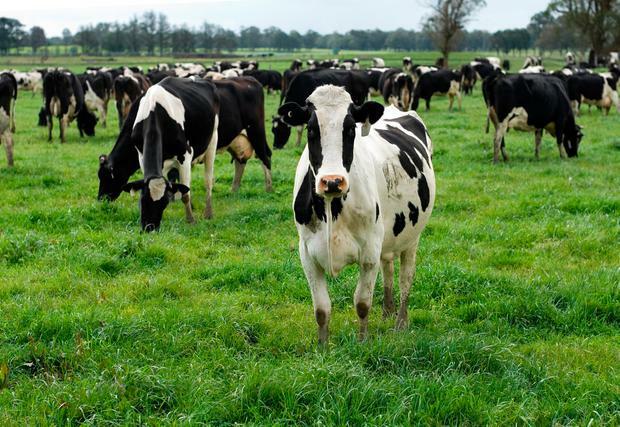 Although agricultural green-house gases (GHGs) are difficult to reduce, it is not impossible and can done by improving efficiencies on farms, according to a recent report by Teagasc. Using their DairyCarbon Navigator, dairy farmers can reduce their farming emissions while also keeping a few extra pounds in their pocket. The DairyCarbon Navigator focuses on five efficiency measures. It collects information from the dairy enterprise and uses this to assess the performance of the farm against peers, by rating performance from poor to excellent. The Teagasc tool estimates the percentage reduction in enterprise GHG emissions that will result from the achievement of the targets which are set. It then assesses the economics if these efficiencies are improved, according to Teagasc. Increasing genetic merit via EBI has the capacity to mitigate emissions at farm level by firstly improving fertility- reducing calving interval and replacement rate, therefore reducing enteric CH4 emissions per unit of product, according to Teagasc. More compact calving can increase the proportion of grazed grass in the diet and reduces culling and replacement rates on the farm. Increasing milk yield and improving milk composition increases the efficiency of production, which lessens emissions per unit of product. Improved survival and health reduces deaths and the incidence of disease leading to higher productions levels and lower replacement rate. According to Teagasc, for every 10 Day Increase in grazing season there is a 1.7pc reduction in GHGs and profitability is boosted by €27/cow. The higher quality, more digestible feed in early and late season grazing, compared to grass silage improves animal productivity and reduces the proportion of dietary energy lost as methane, according to the report. It also says the shorter housing season leads to reduced slurry methane (CH4) and nitrous oxide (N2O) emissions from slurry storage, while also reducing energy use from spreading. Nitrous oxide (N2O) is a greenhouse gas, which is lost to the atmosphere from the breakdown of organic and chemical fertiliser, according to Teagasc. It has 300 times more global warming potential than CO2, so the higher the proportion of fertiliser that is absorbed by plants the lower the losses to the environment, the report explains. It also says a reduction in N fertiliser of 10Kg per hectare will reduce farm GHG emissions by 1pc and improve income by €10/ha. Moving from summer to spring application and the use of low-emission application methods can significantly reduce emissions, according to the report. It explains that spring application reduces emissions following land spreading due to the cooler and less sunlight at that time of year. Reduced Ammonia losses increases the fertiliser replacement value, reduces fertiliser N and associated manufacture and spreading emissions, it says. Low emissions application technologies such as trailing shoe lead to reduced ammonia losses and increases the fertiliser replacement value of slurry, it says. A 20pc shift to spring application can reduce farm GHGs by 1.3pc while a shift to of trailing shoe can also reduce GHGs by 0.9pc, according to the report. Although energy usage accounts for a relatively small amount of total system emissions on dairy farms, they can be significantly reduced, according to Teagasc. In a trial conducted by Teagasc Moorepark electricity consumption ranged from 53 to 108 Watts per litre and cost from 0.23 to 0.76 cent per litre produced, which indicated three key areas to improve on. For a 100-cow herd improving the performance of the plate cooler, installing a variable speed vacuum pump and changing the water heating to gas or oil can reduce enterprise GHG emissions by 1.1pc and lead to electricity savings of €1,400 which can provide a return on the investment in approximately 5 years, according to the study.